Press the buttons E-7 to vend a bike inner tube. Or maybe you need a blinky red light? 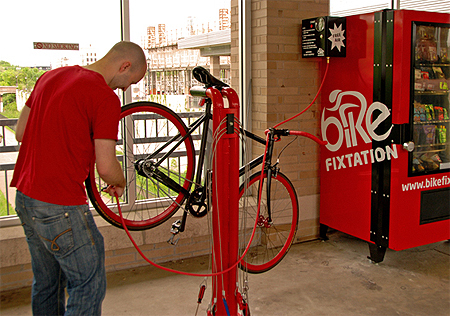 A new concept in Minneapolis, the Bike Fixtation self-service bicycle repair kiosk offers riders an array of items to purchase plus free air to inflate tires in a pinch. 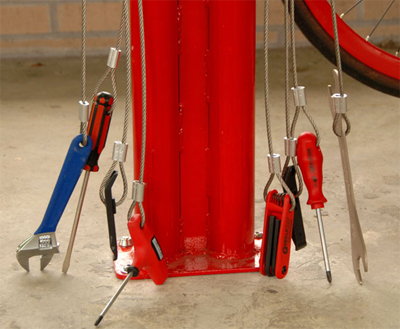 A metal repair stand to hold your bike up and tools free to use are other touches of the unique self-serve kiosk concept. The first full Bike Fixtation kiosk opened last year in the Uptown neighborhood of Minneapolis, just a couple blocks from the headquarters of GearJunkie.com. In May, the company will open another Twin Cities kiosk, this time on the University of Minnesota campus. Started by two area cyclists, the small company hopes to expand the kiosk concept around the U.S. It sells the full kiosk package — vending machine, air pump, stand, and tools — or buyers can pick and choose from the components to fit their need. To me, the free air pump and repair stand are great. 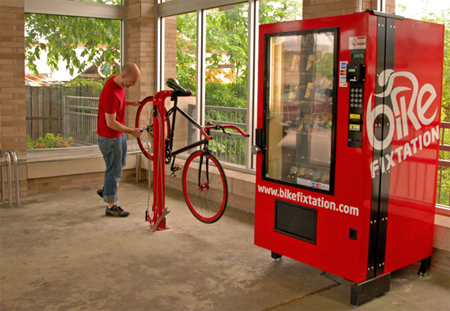 But the vending machine sets Bike Fixtation apart. 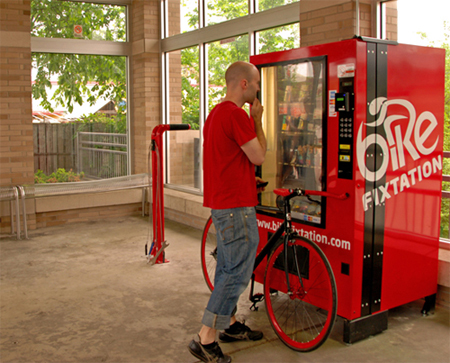 Just like a snack-filled vending machine, the bike-oriented machine offers products to purchase from behind a polycarbonate window with the swipe of a credit card. But instead of Snickers and Hershey bars the bike-theme machine has tubes, patch kits, front and tail lights, energy food, sunscreen, and more. In Minneapolis the kiosk is inside a transit station shelter, essentially right on the sidewalk and near a major bus stop. It’s on one of the busier streets in Minneapolis, near bike paths, and it’s open 6AM to midnight for 365 days a year. Beyond Minneapolis, Bike Fixtation stands and other products have been installed in Oregon and Tennessee. “We’re working on selling equipment so others can reproduce the concept in their own cities,” said founder Alex Anderson. Here’s to Anderson and his business partner! Great idea, fellas. Best of luck expanding the Fixtation kiosk concept around the country to give more options to city riders in need.